Photo taken by a happy customer! Arancini, or “little oranges,” named from the rice balls’ appearance when they emerge from the deep fryer (traditionally prepared), are a street food in Sicily dating back to the 10th Century. 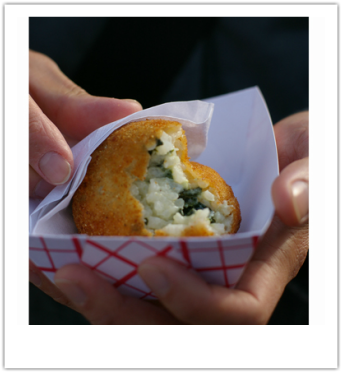 They are wonderful spheres of risotto stuffed (or mixed) with various fillings. Beyond the traditional Arancini with Meat Ragu inside a Saffron Risotto, there are dozens of other varieties both savory and sweet, including seafood, vegetarian, vegan, and gluten-free options. Our varieties change every day.